For the June round of Baking for Hospice, our theme was Mothers. My mum's favourite dessert of all time is cheesecake. I remember we used to go to Robert Harris cafe for lunch in the school holidays when mum and dad had their travel agency in town and every day mum would pick a piece of cheesecake to go with her sandwich and cup of tea. So, in my B4H baking tribute to my mum, I made Zebra Cheesecake. When I saw this recipe on Not Quite Nigella, one of my fav food blogs, I knew I had to try and make it. I was totally seduced by the stripes, I mean that is one good looking cake, right? It was tricky wee recipe though, with lots of different steps and used almost all the bowls I owned! The kitchen looked like a tornado had gone through it when I was done, but I tell you what, seeing that cake come out of the oven, with it's beautiful stripes and lightly golden top was just about the most satisfying baking experience I've ever had. I had seen in a number of recipes for Japanese cheesecakes that you leave it to cool in the oven for about 10 minutes then take it out to cool on the bench. The idea is that the cake needs to cool slowly to stop it sinking. So I did that, but the cake still sank in the middle and wrinkled up on cooling. I am determined to make another Japanese cheesecake (even if it is just a normal one, not a zebra) though so please if you have any tips for keeping the cake nice and fluffy please let me know! Lightly grease and line the bottom and sides of a round 12 inch springform tin with baking paper. Wrap the bottom of the tin with three layers of foil to stop water seeping in. Find a large baking dish that will fit the springform tin. Fill the empty baking dish 1/4 of the way full with water and place the baking dish with water (leave the lined springform tin out) in the centre rack of an oven and switch it on to 160oC. Melt cream cheese, butter and milk over a double boiler and whisk to get out any lumps. Cool the mixture over an ice bath. Fold in the flour, the cornflour, 6 egg yolks, lemon juice and mix well. In a separate bowl, whisk 6 egg whites with cream of tartar until foamy. Add in the sugar and whisk until soft peaks form and there is no liquid egg white at the bottom. Add one third of the egg white mixture to the cheese mixture and mix to loosen. Then add the rest in third batches and mix well and ensure that the egg whites are thoroughly combined gently by folding until there are no streaks in the batter. Divide the batter evenly in two and in one bowl, sift the cocoa in it and combine well using a folding action. You end up with a bowl of yellow batter and a bowl of cocoa batter. Take your lined springform tin and place tablespoons of yellow batter in the centre of the tin - it will form a puddle. 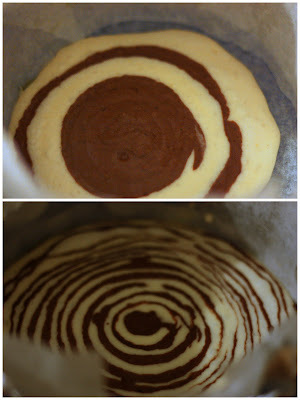 Then take 3 tablespoons of the cocoa batter and place in the centre of the yellow batter puddle. Keep adding alternating puddles in the middle of the previous and the batter will spread of its own accord. You need to pour the spoonfuls out carefully and near the end need to let the batter sink in before adding the next spoon. Keep adding 3 tablespoonfuls of batter until both of the batters are used up. If there is spare batter left over you can use it for little cupcakes by lining silicon cupcake cups and floating them in the water bath next to the cheesecake. Carefully transfer the cheesecake into the water bath, being careful not to tilt the tin. Bake cheesecake in the water bath for 1 hour or until a skewer inserted in the centre comes out clean and the top is golden brown at 160oC. Cool completely in the tin before removing. I didn't get a chance to cut into the cake and taste it, as the whole thing went to the hospice, but I did have some left over mixture that I made into wee cupcakes and ate them. The texture was similar to a normal cheesecake and a little dense, but that could have been because the cupcakes sat around for a while before I baked them. The recipe was also not very sweet. Maybe next time I will try adding a little extra sugar. Yum Cha at Pearl Garden, New Market, Auckland. Review: Jafa, Grey Lynn, Auckland.